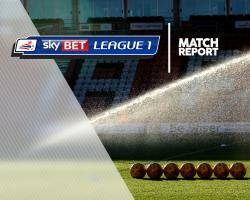 Swindon 0-1 Chesterfield- Match Report - Swindon Town MAD! Substitute Reece Mitchell struck in the third minute of time added on as Chesterfield bolstered their Sky Bet League One survival hopes with a 1-0 victory at fellow strugglers Swindon. Mitchell was introduced in the final 10 minutes, replacing the ineffective Sylvan Ebanks-Blake, and the change proved an inspired one as he netted his first goal of the season. The Robins had the first chance of the game in the 14th minute when Brandon Ormonde-Ottewill picked out Luke Norris at the far post but the striker stabbed his effort wide. Swindon then missed another sitter five minutes later after Anton Rodgers' free-kick found an unmarked Nathan Thompson but he sent his shot over the bar. Chesterfield had to wait until the stroke of half-time to register an attempt at goal when Liam Grimshaw tried his luck from range but he failed to hit the target. Jon Obika then went close for the Robins in the 63rd minute when he was gifted a free header in the area but he could not direct it on target. Chesterfield then won it through Mitchell after he latched onto Ched Evans' cross to give his side a vital victory with the last kick of the match.